A couple weeks ago, I visited Zion National Park where I made some shots that I intended to merge into HDR images, and inspired by a discussion at my local photography club I thought I'd settle down to get it done. While I was at it I created a tutorial to share with everyone. The final HDR image represents what my eye saw at that moment even though the camera wasn't able to capture it in one exposure alone. What is HDR? High Dynamic Range... Think of a scene that has bright sunlight and dark shadows. A single image can't capture all parts of the scene in a proper exposure, but if you take a series of photos of exactly the same scene while altering the exposure between each shot, then later you can blend the images together in Adobe Photoshop CS2. 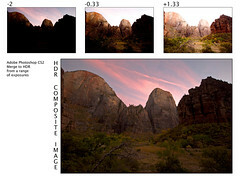 In computer graphics and cinematography, high dynamic range imaging (HDRI) is a set of techniques that allow a far greater dynamic range of exposures (i.e a large difference between light and dark areas) than normal digital imaging techniques. The intention of HDRI is to accurately represent the wide range of intensity levels found in real scenes ranging from direct sunlight to the deepest shadows. First, it's important to turn off some automatic exposure features so that you have full control because you don't want the variation introduced when the camera automatically adjusts exposures between each shot. First, determine the correct exposure for the overall scene and set it manually. If you're camera is normally on Program (automatic) mode, point the camera at the scene and note the aperature and shutter speed, then turn the dial to Manual and select those exposure values. Next, turn off Automatic White Balance (AWB) by setting it to a specific temperature or icon such as Sun or Cloud. Generating an image series for HDR works better if you have a tripod since you'll want avoid the slightest shake or variation between shots. It also works better if you have more than 3 shots to combine, perhaps as many as 7 or 8 even. On my trip to Zion, however, I didn't have my tripod, since I was away on business earlier. I had to take the shots handheld, or at least while resting the camera on something steady. Most SLRs have menu options to do auto exposure bracketing (AEB) of 3 images, so I decided to try using that feature as the foundation for creating and HDR image rather than trying to manually fumble with shutter speed in between. It would be great if camera manufacturers began offering autobracketing options for more than 3 pictures, but for now that's what we have to work with. To take a series of photos with the camera's AEB feature, I could set AEB so that each expsoure is about 1 stop apart, such as -1, 0, +1. For Zion, I preferred the shots to be slightly under exposed anyway and the contrast was very strong, so I used wider autobracket exposures of -2, -0.33, and +1.33. Then I set the camera for multishot so that when I depressed the shutter button the camera automatically snapped 3 images in quick series. If you have a tripod, then you should try 6 to 8 exposures per series, each with about 2/3 or 1 stop apart such as -3, -2, -1, 0, +1, +2, +3 for example. Assuming the lighting is decent, just click, hold down, and try to stay perfectly still until all the shots are done. Doing this yourself, you should hear a rapid 'click-click-click'. However, if the lighting is darker, then the second and third shots will be noticibly longer, so you get a 'click', 'cliiiiiiick', and 'cliiiiiiiiiiiiiiiiiiiiiiick' in a row. Without a tripod or camera rest, for the third exposure to come out well its very important to control your breathing and steady your arms well against your body while shooting. The general rule of thumb to avoid camera shake is that when handheld the camera's shutter speed should NOT be longer than (1/focal length). In my example photo from Zion, I was using a Sigma ultrawide telephoto of 10-22mm set at the widest of 10mm. At the focal length of 10mm the slowest shutter speed should be 1/10 of a second to avoid shake. The camera would display this simply as 10 instead of 1/10 usually. If any of the autobracketed shots require a longer exposure time and you're still without a tripod, then consider resting the camera against a tree, wall, or bench. If no camera supports are available, only then consider raising the ISO value. Whenever possible, I avoid the temptation to bump the ISO from 100 up to 400, 800, or 1600 because I don't want to introduce the graniness that accompanies those higher values. The ISO setting makes a dSLR more sensitive to light but at the expense of quality. I try to keep the ISO low at 100 or 200 for better image quality even though I may have to seek out a stable platform on which to rest the camera (i.e. a tree, a bench, etc) because the shutterspeed will be slower in dark settings with low ISO values. See What is ISO? on Photoxels.com for an indepth explanation. Back at home, working with digital images (original digital or scanned from film), open Photoshop CS2 and the associated Bridge program to get started. If you're camera has taken RAW images (.CR2 in Canon cameras), then you'll first want to convert them to high quality JPGs. In Bridge, select all the images for the series and open them in the DNG sub-program. Select all RAW images on the left pane, turn off all automatic features for exposure, brightness and such, then click Synchronize. All the images should now have their original exposures without any enhancement. Click Save Images to generate the JPGs, and close DNG. Here you will be shown a 32bit preview (JPGs are in 8bit, so this has image has more info than your screen can show you) with all the input thumbnails on the sidebar. Adjust the slider under the histogram for Set Whitepoint Preview until you're happy with the result, you'll have another chance to adjust exposure again later. You'll now have a 32bit image that should have an even exposure without the strong contrasts. If you're very satisfied so far and you think you may want to work on it again or print it at the highest quality later, then save the file at this point as a .PBM (Portable Bit Map). Here you'll be presented with a pop-up window for HDR Conversion with a default option for Exposure and Gamma, having two sliders. Move the sliders around until you get an exposure you like. There is a Toning and Histogram graph at the bottom (hidden by default) which can't be modified in this view. If you're up for a challenge, you could choose Local Adaptation rather than Exposure and Gamma because Local Adaptation will let you manually adjust the Toning Histogram curve, and that's how people achieve the surreal effects seen often on Flickr. In brief, when using Local Adaptation drag the lower left end of the curve to the left edge of the histogram curve, then begin massaging the curve slightly through the middle until you achieve a balance in the overall image contrast. For a tutorial on HDR which also includes how to adjust the Local Adaptation Toning Curve for finer customization see How to Create Professional HDR Images on the Backwinds blog. You might be happy with the image here so you could save it as JPG with Quality Level of 12 (highest), or you can do further manipulation. Image > Adjustments > Shadows / Highlight: This will allow you to brighten only dark areas and darken only the light areas. Its very sensitive, so you probably only want to adjust up to 10 for either setting (on a scale of 100). By default the setting pops up with Shadows setting of 50 which completely blows out the image, but don't worry, just move it back to 0 and test sliding up to 10. Contrast: Avoid using the menu option called Contrast, instead use Image > Adjustments > Levels or just [CTRL+L] . Yes, the Levels command is somewhat redundant with the Shadows/Highlights control, but you can perform some fine adjustments in Levels even after running Shadow/Highlights. Try moving the little black triangle (the black point) on the left and the white triangle on the right (the white point) towards the center, but just a bit. Often you'll see peaks on the left and right of the histogram that don't touch the sides, so you could move these black and white sliders towards the center until they are at the position where the peak starts. Moving the black triangle to the middle makes darks go to black, and moving the white triangle inwards makes lights go white. Saturation: You can enhance the overall saturation of these creative images either collectively or by color. Using [CTRL+U] to get the saturation window, you'll find Edit Master for all colors, or Edit Reds, Yellows, etc for individual colors. Then just move the Saturation slider. Usually 20 to 40 can really make the image brighten up and pop. Save the image as JPG and share or send to your friends. That's it! You should now have a colorful image with an even exposure. In my experience they almost always come out looking a little dark, and they print a little dark, and I haven't had much luck making the images as light as I'd prefer. Still, HDR images almost always look better than an original image having the high contrast between shadows and sky. This entry was posted on November 11, 2006 at 7:09 PM and has received 106965 views. There are currently 5 comments. Print this entry. Hey, appreciate the tutorial. I think some more expensive dSLRs allow autobracketing that yields up to 5 frames. Do you have any idea why it is recommended to convert the RAW images to JPG before applying the HDR technique? I have never done any HDR work; however, I often play a lot with the tone curve in RAW lightroom software... this is more of an art than science, but it can contribute to the general motivation of pulling information out of otherwise blown-away parts of the photo. First time I try HDR and really needed a good tutorial. Yours is great! I do not have Photoshop CS and not CS2. Hence there is not Merge To HDR. Is this not possible in Photoshop CS? I have Photoshop CS and not CS2. Great tutorial. I appreciate your posting this.